If one is serious about studies, be it study about Islam or any other subject, one spends quite a lot of time of the day studying. Still, sometimes we find it very difficult to cope. We seem to always fail to do as much as we expect from ourselves. Sometimes we wonder how time flies. One day the exam seems weeks away, a few days later it seems much closer – only ten days left! What we don’t realize is that our time is limited – there are only 24 hours in a day, only 7 days in a week. That’s not going to change. Far more importantly, our lifespan is limited. We haven’t a clue when we’ll die. Time is a limited asset, and a very important asset, because Allah swears by it. What can we do to perform better in our studies? Increase the amount of time we study? But time, as we said, is limited. There is a far better way of making it work – make better use of that limited time. For some people this comes naturally. If you look closely at the study habits of the top students, you’ll see that it’s not just about working harder, or studying longer. You’ll soon discover the secret of their success – heir habits are much different from others. 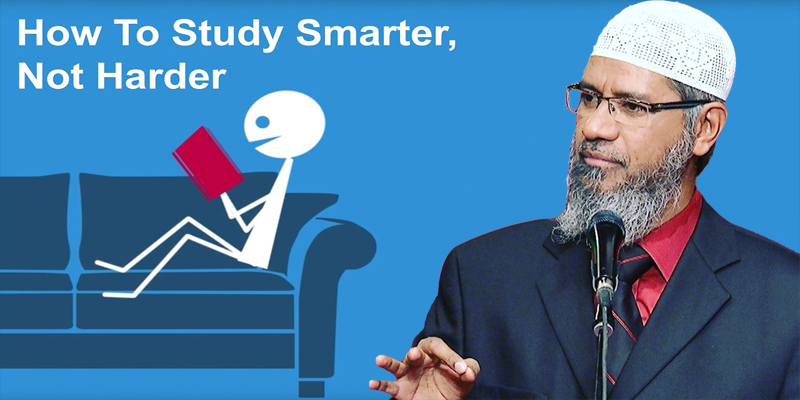 It’s not a magic formula, it’s very simple – they have developed smarter habits of studying efficiently. They don’t just study harder, they study ‘smarter’, which is good news for you and me – because if they learned these habits, we can learn them too! So the key to virtually lengthen our weeks, days and hours – is by spending some time learning how to study smarter. There are a lot of resources available on the net which will help us become smarter students by the will of Allah. A passive student is one who spends little effort in being creative. He or she listens to lectures and often takes extensive notes, reads through books with the highlighter, follows instructions closely when doing assignments, and revises their notes before studies. On the other hand, active students don’t just go to lectures and take notes. Even before that, they read the syllabus thoroughly, get a grasp of what the course is about, its scope, how the topics are arranged, and what they will gain from it. Then they skim through the handout or book chapter before the lecture, and generate some questions for which they want answers from the lecture. They don’t just write notes, they write them in their own words, summarizing reading materials, and creating charts, flow diagrams, mind-maps and other learning tools. And they try to relate new information with old, find relationships, similarities and differences, and categorize into themes. They review actively by self-testing, and intermittently to ensure long-term memory. How nice would it be if you could read a book in half the time you usually take! It’s not difficult as it might sound. It is real and possible. Speed-reading is not just moving your eyes faster through the lines. It is an art – involving many techniques. And it takes time and practice, but it’s worth it! Multitasking in study is not a good idea. The more you concentrate on a specific task, such as listening to a lecture or reading your notes, the more you will gain from it. You’ll have to spend less time in future to study the same topic, thus saving considerable time.